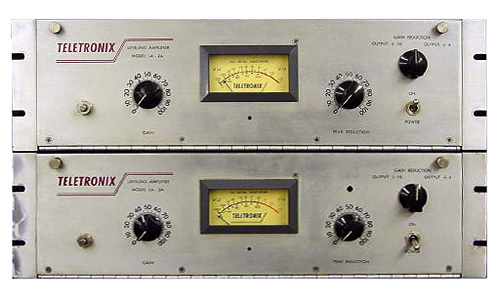 Just adding this baby for posterity - Originaly from Teletronix, they eventualy were bought by Universal Audio - The original was discontinued and now you can get a re-issue made by UA. The original LA2A's go for about $3500 ish - the new ones are priced about the same. Made first in Sunnyvale CA (not far from McDSP headquarters), this peak limiter has become one of the most sought after devices in music production. The LA2A, as well as other pure class A opto-compressors, are characterized by their soft knee and compression 'tail'. This gives the compression response more 'presence' in the mix as the amount of compression actually decreases when enough signal is driven into it to reach the 'tail'. Mono valve optical compressor/limiter. Designed by Bill Putnam, it has a unique electro-optical attenuator system allowing instantaneous gain reduction with no increase in harmonic distortion, producing very natural compression characteristics. Stereo link. Minimum of knobs and fat, warm sound, the sort of unit that gave valves a good name; now reissued. Absolute all time classic design, much copied. Check the links (right-column) there is a project page listed to build a clone version for all your diy buffs.